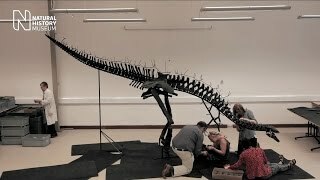 The animation is based on the most complete Stegosaurus skeleton ever found. Affectionately dubbed Sophie, this specimen is on display in the Museum's Earth Hall. It has been laser scanned and reconstructed in virtual reality for Hold the World, a groundbreaking interactive experience that is set behind the scenes at the Museum. Take a sneak peek at the virtual dinosaur above and find out more about some of the features of its strange-looking body below. Where is this specimen from? This Stegosaurus lived about 150 million years ago during a time in Earth's history called the Jurassic Period. It would have lived in present-day Wyoming, USA. The skeleton was discovered in 2003 by professional fossil hunter Bob Simon, who was digging at a site called Red Canyon Ranch in Wyoming. It was a special find, because most of the Stegosaurus skeletons that are found are incomplete. Prof Paul Barrett has been a dinosaur expert at the Museum for nearly 15 years. For Paul, the day Sophie came to the Museum was a momentous one. 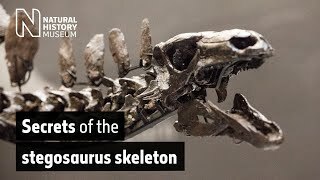 He says, 'This skeleton is very special, not just because it is complete, but also because the bones have been preserved in three dimensions instead of being squashed over time, as happens with many other fossils. So we can get a very accurate view of how the whole body looked. 'We've been able to use the skeleton to really probe the biology of Stegosaurus, and this is a dinosaur that's not been studied extensively before. Sophie's head is quite small. 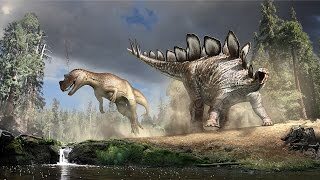 Scientists have found that Stegosaurus would have eaten ferns and tough vegetation, with a bite force similar to a cow. Stegosaurus moved around on all fours, but you'll notice that Sophie's legs are different lengths. The front legs are fairly short, while the back legs are relatively long. That's because Stegosaurus descended from earlier dinosaurs that walked only on their back legs. Its ancestors originally used their short front legs to pick things up and grasp them. But in Stegosaurus they've become modified to support its body weight. This mismatch in arm and leg length limited Stegosaurus to a relatively clumsy, slow-moving walk. Sophie wasn't able to run, and was certainly no athlete. She was probably limited to walking speeds similar to those of walking rhinoceroses or elephants - only a few miles an hour. Stegosaurus has a relatively small head and mouth. Scientists have puzzled over how they managed to eat enough food to sustain such big bodies. The teeth are the size of a little fingernail, and not particularly well-suited for grinding or crunching large amounts of plant food. After CT-scanning Sophie's skull, palaeontologists reconstructed her jaw muscles and worked out how hard she could bite. Did Stegosaurus have two brains? No. There are some common misconceptions about Stegosaurus - one being it had two brains, one in its skull and one in the hips. But it turns out that this space in the hips had nothing to do with a second brain. Rather, it's a storage area for some food substances that allowed the dinosaurs to survive through periods of stress, when there was less food in the environment. Why does Stegosaurus have plates? Scientists have speculated for years about why Stegosaurus had large plates along its back. Some early palaeontologists thought that they might have been for defence, but this idea has now gone out of fashion. The plates, although very large, are also thin and fragile. We now think that the plates may have had one of two different functions: either for display or for regulating the animal's temperature. Paul says, 'Using the plates, Stegosaurus may have showed off to each other, displaying how big, strong and attractive they might be. Visit Sophie in the Museum's Earth Hall. Admission is free. This animation was designed to be viewed via a VR headset, as part of Hold the World. Dinosaur researcher Prof Paul Barrett gives the lowdown on the most complete Stegosaurus ever found.